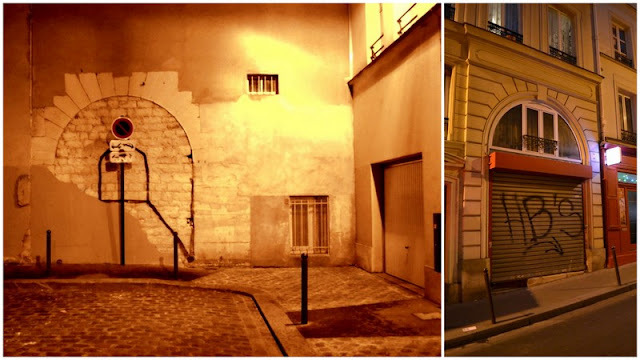 One of the first posts I wrote on this blog back in 2008 was about a mysterious bricked-up passageway in the 9th arrondissement. Thanks to the recent intervention of a reader who happens to live above the arch, I have been motivated to - partially - solve the conundrum. 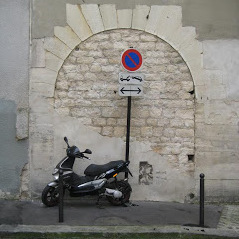 My original post on this archway at the end of the Cité Fenelon did not even consider what may be on the other side. It was a curious feature of the cityscape, but one that I quickly forgot about - until a reader contacted me with more information. "I happen to live in an apartment directly over the bricked-up passageway and naturally the blocked doorway made me curious too" he began. This reader though lives not in the Cité Fenelon, but on other side, in the building that fronts on to the Rue Rodier. 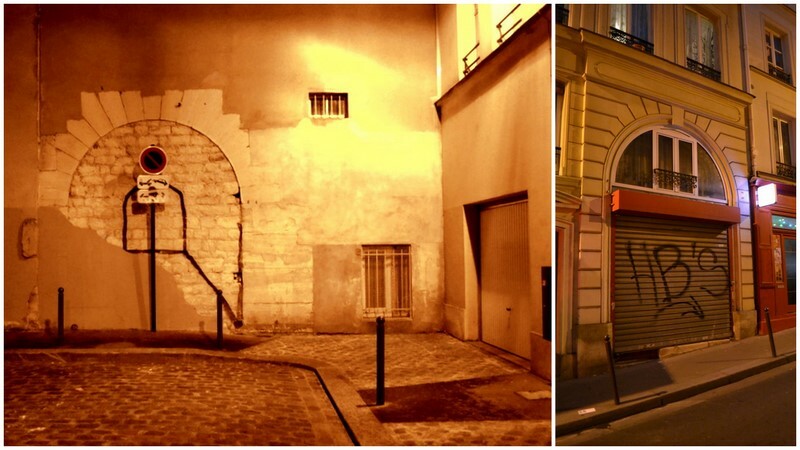 Strangely, "there is zero evidence of that doorway on the inside walls of the courtyard, yet once you emerge onto rue Rodier, there is a corresponding archway built into the fabric of the facade." His information had reignited my interest in the passage, and I had to investigate. Through a strange coincidence I was finally able to get a very close look at the passageway. with the passageway leading through n°19 Rue Rodier. I wanted particularly to see the corresponding archway on the Rue Rodier, but as I was taking photos of this door (which today houses a shop), I caught sight of somebody looking at me strangely. "You must be Invisible Paris" said that person, "I don't know who else would come and take photos of this building!" Arriving to take photos just as the person who had contacted me returned home was a chance encounter, but it also gave me the perfect opportunity to see inside the courtyard and attempt to trace the path of the old passageway. As the person had previously informed me though, there was very little to see inside the building. can be seen behind the door on the courtyard side, but the ground level seems to be much lower here. The Cité Fénelon archway again, this time with the corresponding archway on the Rue Rodier. After walking through the first part of the building on the Rue Rodier we came into a small, square courtyard. Immediately opposite was the part of the building which backs onto the Cité Fénelon, and in theory the path of the passageway. There was no evidence here though that any such path ever existed, despite being bookended by two archways. So was there ever a pathway here, or was this some kind of architectural and urbanistic jape? To find the answer, I would have to step out of the physical world and into the world of maps. It was a quest that was utterly unimportant, but also one that might show in a small way how Paris developed, and how the (hidden) traces of that process can sometimes remain imprinted on the cityscape. 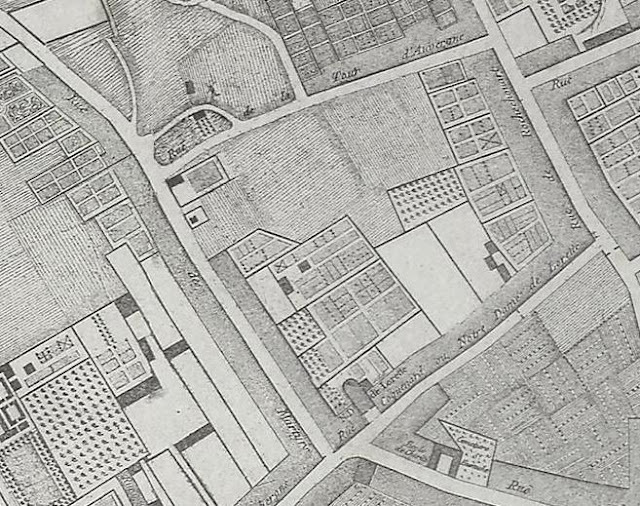 First stop - the Jaillot map of Paris from 1775. This is the first time we see the area included on an official map, but if the area in which the Cité Fénelon and the Rue Rodier are situated today is just fields, the square that surrounds them - made up of the Rue des Martyrs, the Rue de la Tour d'Auvergne, the Rue Rochechouart, and the road on which sits the Notre Dame de Lorette church - is already clearly visible. Although these agricultural plots seem to be quite clearly defined, this may just be artistic licence on behalf of the mapmaker. It is interesting to think though that the passage may already have existed as some kind of primitive footpath through cabbage patches and orchards. 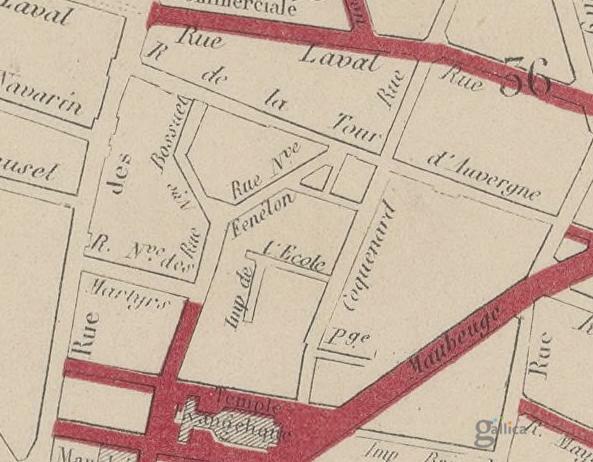 By 1830, as seen in the Girard map below, a new road has appeared - the Rue Neuve Coquenard. According to one source, the Rue Neuve Coquenard grew from a dead-end called the Impasse Brutus which already existed in 1790. From map to map it becomes clear that the area has always been in constant mutation, with paths leading nowhere eventually reaching out to other paths, before later closing up their fingers once again. 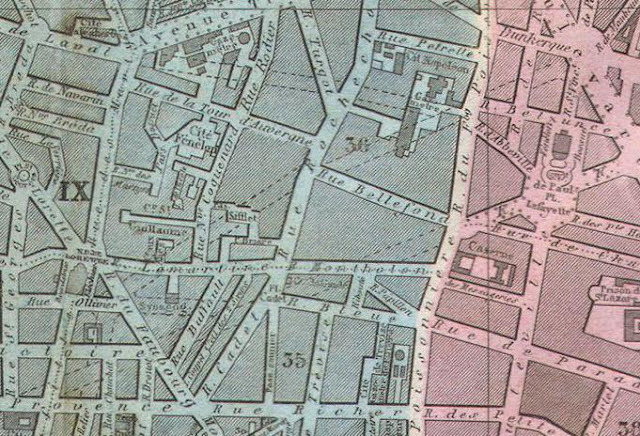 Around 1840 (see the unknown map below) a series of winding passages begin to appear - but nothing still on the site of today's Cité Fénelon. Interestingly, one of these passages is called the Impasse de l'Ecole which naturally enough led to a newly-built school. This address still exists today, but just for a small branch of this road. 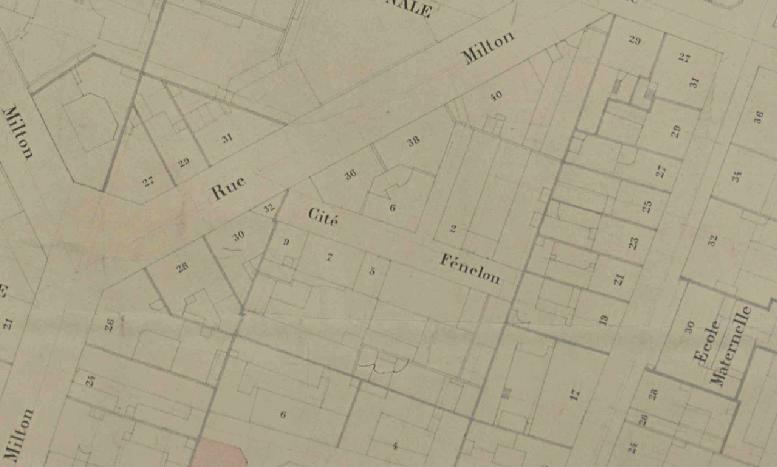 The original Impasse de l'Ecole was renamed the Rue de l'Agent Bailly, and now opens out onto the Rue Milton (and is also a street that I have already visited on Invisible Paris). Finally, in the second half of the 19th century, the passage appears - but with a malleable name. In the Andriveau Goujon map of 1868, just below, it is called the Rue Neuve Fénelon. By the Hachette map of 1870, underneath, it has become the Cité Fénelon. Both addresses, albeit with curious forms, clearly branch out onto the Rue Neuve Coquenard. These addresses though were apparently short-lived (and also occasionally absent from other contemporary maps). 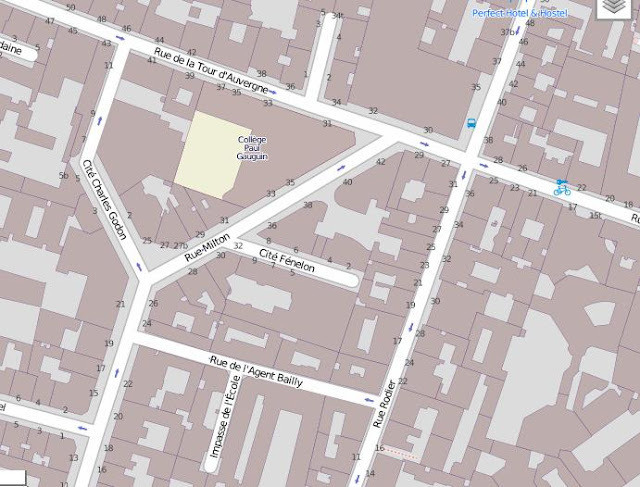 By the 1910 city of Paris 'plan parcelaire', the Rue Neuve Coquenard has become the Rue Rodier, and the Cité Fénelon now has its current form - closed off by the rear of the building at number 19. The maps show that the passage did once exist, but a number of mysteries remain. 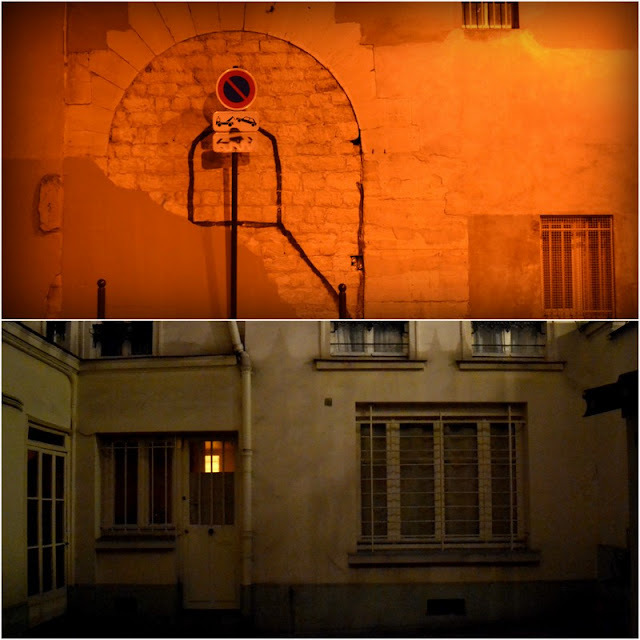 When was the building at 19, Rue Rodier constructed, and was this what closed off the passage? If so, why does it still have archways at either end? If the passage remained in place after the construction of the building, when and why was it later blocked off? Another message seems to be that mapmakers cannot be trusted. It is difficult to find two maps that show the area with the same forms - when they appear on the maps at all. Clearly this was not a particularly important part of the city, and this particular passage even less important - but perhaps not to those who lived by. The final clue to the function it may once have had can be found on the city of Paris's database. Although listed on none of the maps, the path was apparently once known as the 'Cour du Puits' - the well yard. This points not only to an important role it may once have played, but also perhaps to a much longer history. If there was indeed a source of water here, those living in the vicinity would have created the passageways themselves with their own feet. This though also suggests one further mystery. If there was once a well here, where is it today? I love it when you play detective like this, and what a very interesting post! It is post like this that inspired me to be more attentive and keep an eye out for unusual features in the city. I love your detective work, too. These are among your most interesting posts - and that's saying a LOT! Thanks for all your scholarship, and curiosity, and sharing! Thanks for the messages. These are also the most interesting posts to work on I must say, but it does depend on finding the right subject. If anyone has any suggestions, please drop me a line! 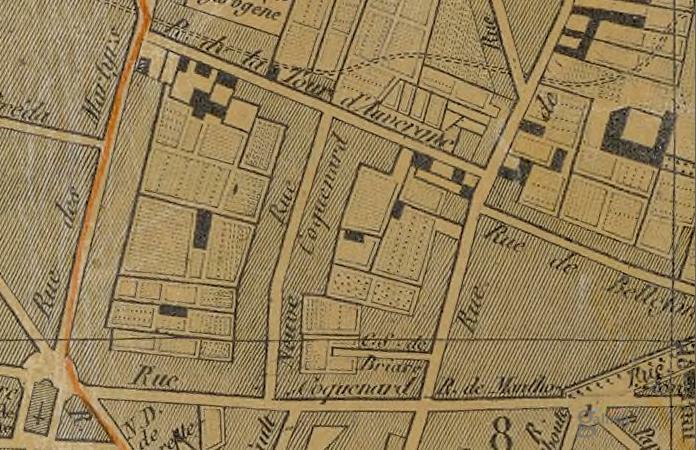 This is a long shot, but the 'Cour du Puits' detail made me wonder if maybe the place was once something like a fontaine, like the one on rue Mouffetard? I enjoyed your careful review of the maps. I could stare at them for hours. Cour du puits is interesting, since "puits" can means all kinds of things in addition to a well (the French version of Wikipedia has a long list). I sense a story there. 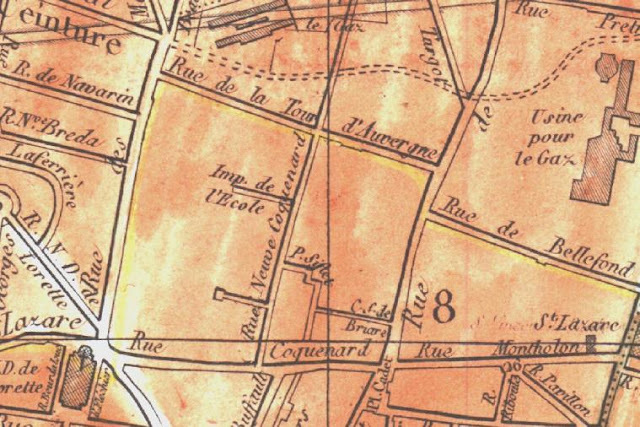 One of the considerations in the changing of the Paris streets and maps since 1910 could be that there were two major World Wars after that date in which Paris was bombed and/or occupied. Rebuilding might have had a hand in subsequent changes in the maps. what an investigation!! I too wondered where this passage was going "before". One of dearest member of my family's got his room windows looking on the cité Fénelon. And recently when I noticed someone painted sort of a tunnel I found it was a perfect illustration of the feeling I had. As if this wall was going elsewhere, through the bricks themselves.